Algae in small amounts appears on most plants that are grown in water. In small amounts, algae won't harm your plant, but in large amounts, it can completely coat the root system, blocking your plant's access to water and harboring root rotting bacteria. It's also unsightly. Because algae and algae spores are common in water, it's difficult to have a completely algae-free bamboo plant, but it is possible to keep algae at low and healthy levels. Lucky bamboo is not actually a bamboo plant. This common houseplant is a member of the lily family. It's capable of flowering in the right conditions. It's been used for centuries in an art form called Feng Shui, which aims to use the natural landscape and elements from it to promote health, prosperity and positive energy in the home. It comes in curly varieties and varieties with lots of leaves and foliage. It's regarded as an ideal houseplant because it thrives in indirect lighting conditions and needs little care. One of the chief causes of algae growth on lucky bamboo plants is the wrong type of container. Clear glass or plastic containers allow sunlight to reach the water, anchoring medium (rocks or sand) and roots. This sunlight kick starts any present algae spores and supports their growth. Overfeeding lucky bamboo also creates conditions conducive to algae growth. Algae thrive on nutritious water, while lucky bamboo plants do not. Water with treatment chemicals such as nitrates and phosphates can support algae growth. Finally, too much sun exposure, regardless of container type, can cause algae overgrowth. The first step to ridding your plant of algae growth is to wash the contents of your planting container. Thoroughly wash and dry the container and the rocks. Gently rinse the roots and stalks of your plant and use your fingers to try to sweep away as much algae as possible. 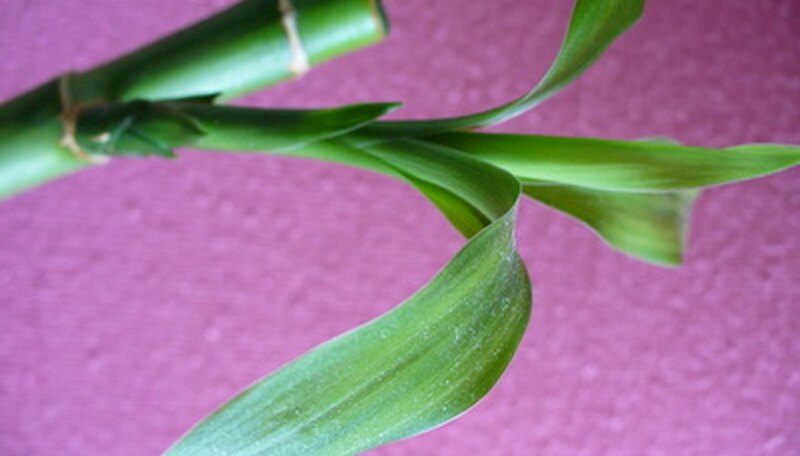 If you have extensive algae growth on your bamboo plant's roots, you may have to use sharp scissors to clip away a few of the most infected roots. Do not aggressively trim the roots or you could cause some of your foliage to die back. Just clip a few of the worst roots. Replacing your clear glass or plastic pot with a ceramic container will greatly reduce algae growth. The water you use is also important. Lucky bamboo plants prefer filtered water because tap water contains chemicals that both encourage algae growth and discourage bamboo growth. Filter your water or let your tap water sit out in an open container for a day or two before giving it to your plant. Avoid giving your bamboo plant food. Bamboo plants need only one drop of liquid fertilizer once or twice a year. More food encourages algae growth and can burn your plant's roots and cause permanent damage. Move your plant to an area where it will receive indirect sunlight rather than direct sunlight. Finally, use a few drops of aquarium algae prevention drops designated safe for aquarium plants. Do this as a last result if your algae problem keeps coming back even after you've corrected your bamboo plant's growing conditions. Another solution to algae growth on your lucky bamboo plant is to remove it from its water and anchoring medium and pant it in a pot with soil. Lucky bamboo plants thrive purely on sunlight and spring water, so the soil will only be an anchoring medium. Because of this, it's important to use a plain soil with no fertilizers or soil amendments. Lucky bamboo plants in soil typically wilt or die because the soil eventually dries out. The key to growing your plant in soil is to consistently water the soil to keep it moist. Use the same filtered water you'd use for plants grown in water and expose the plants to the same indirect lighting conditions.